Ellensburg Winterhop – Jan 21 – SOLD OUT. Too late to get in on this popular festival in Ellensburg. New Year Beer Festival in Bremerton – Jan 22 – 15 breweries will be pouring, and most of them are located in Kitsap County. Easy ferry ride over to Bremerton from Seattle, and you can walk to the fest from the ferry terminal. Strange Brew Festival in Port Townsend – Jan 27 to 29 – One of the region’s most unique festivals, the attending breweries will bring some crazy beers. Crazy interesting, and hopefully crazy good. Belgianfest – Feb 4 – This year’s Belgianfest moves to the Bell Harbor International Conference Center on Seattle’s waterfront. Lots of great Belgian-style brews from WA breweries. Hops & Props – Feb 25 – SOLD OUT – You have to get in on this festival at the Museum of Flight early if you want to attend. Beveridge Place Barleywine Bacchanal – Feb 25 to Mar 3 – Let the celebration of barleywine begin! More than 40 different barleywines rotating throughout the week. Includes verticals and special releases. Brouwer’s Cafe Hard Liver Festival – Mar 3 – One of the country’s largest barleywine fests. 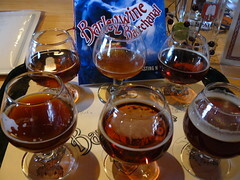 Hard Liver features over sixty barleywines and includes a professional judging. Hop Scotch Spring Beer & Scotch Fest – Mar 30 & 31 – This festival at Fremont Studios has a little more swanky vibe than your typical fest. Lots of great beer and scotch for tasting. Washington Cask Beer Festival – Mar 31 – This is probably my favorite Seattle beer fest. More than 70 unique beers from WA breweries served from a cask.